An excellent example of adaptive reuse - an old Aero Club building relocated to the beach front at Lyall Bay has been transformed into a popular café and bar that makes the most of its stunning position. The major refurbishment of the relocated building, with structural upgrading, recladding and total window replacement, has been carried out in a manner that preserves its heritage character. A contemporary extension has been added to the east of the original building with sliding walls of glass that provide level access to sheltered patio space that in turn spills onto a generous lawn. 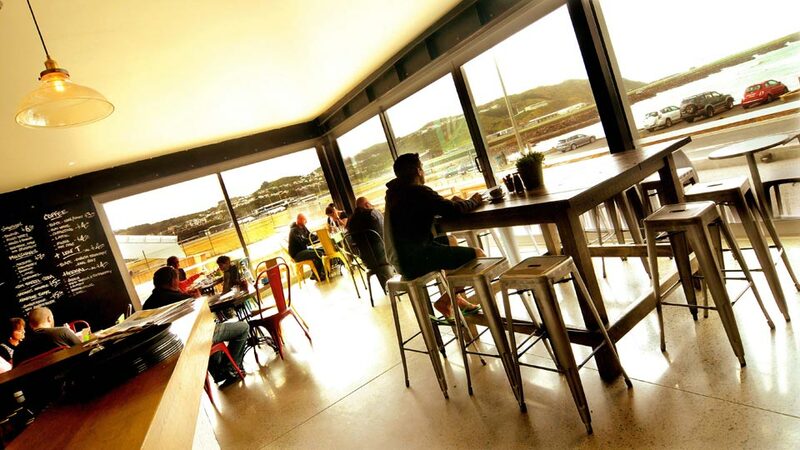 The internal arrangement has been orientated to ensure that the expansive views of Lyall Bay beach are maximised and enjoyed throughout the cafe. There are also great views of planes landing at Wellington Airport, particularly from the huge first floor deck on the eastern side of the building. This new establishment has become a feature of the Lyall Bay beachfront. It sits comfortably on its prominent site and contributes enormously to this vibrant and popular destination. The success of this project is borne of the collaborative approach to the design. The building owner, builder, lessee, Architect and Engineers have all contributed significantly to the delivery process and the outcome is plain for all to see. Spruce Goose Cafe was awarded silver in the 2015 New Zealand Commercial Project Awards in the Retail Category.